If you want your installation program to personalize the installed copy, or if only authorized (paying) users should be allowed to install your software, DeployMaster's Identity features will help you out. As mentioned in the Language topic, you can edit the text that the user will see. If your application can only be installed with a valid CD key, you could mark the "ask for a serial number" checkbox on the Identity page and change "Product &serial number" into "CD key printed on the back of the jewel case". This will make it easier for the user to figure out exactly what to supply. You can create a different language for this, which could be named "English (CD key)". There are two ways to validate and store the identity information the user entered. The most thorough method is do use the support DLL that you specify on the Project page. This DLL must implement the four identity DLL routines that DeployMaster will call. Sample DLLs in C and Pascal are provided. 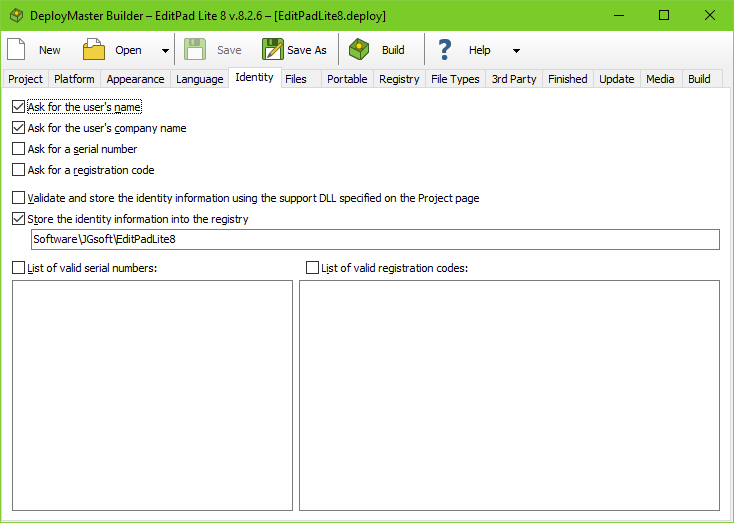 The same DLL can also provide other support routines for your installation software. The other way is to have DeployMaster store the information in the registry. Specify a registry key under Software such as Software\YourCompany\YourApp that DeployMaster should use for this purpose. The key will be created under HKEY_LOCAL_MACHINE for an all-users install and under HKEY_CURRENT_USER for user-specific installs. The user's name will be stored in a value called "Name". The company name will be stored as "Company", the serial number as "Serial" and the registration code as "RegCode". If you ask for a serial number and/or registration code, you can have DeployMaster compare the information entered by the user against a hard-coded list of valid serial numbers and/or registration codes. To do so, tick the corresponding checkbox and enter the list of valid codes. Note: DeployMaster does not provide any copy protection beyond asking for a serial number and/or registration code. If your product needs strong copy protection, you must apply the copy protection to the software itself, not to the installation program.